Confidence is one of those concepts that everyone instinctively understands, but if you ask people to define it, you get a variety of answers. We all intuitively know that confidence matters and that a lack of it impedes professional effectiveness and career progression as well as personal well-being and satisfaction. Back in 2002, I was one of the original developers of a coaching model that helps individuals get the best from everyday life. In addition, I have integrated aspects from the field of Positive Psychology, which aims to increase an individual’s basic appreciation of life, well-being and general happiness. Cognitive Behavioural Coaching is a model that works for coaching clients in everyday situations. While there are many excellent books about the CBC approach, none of them focus directly on coaching confidence issues in the workplace. An introduction to the basics of Cognitive Behavioural Coaching and how this approach can be used with coaching clients in dealing with confidence issues. Skills that can be used both in a work setting and the Personal/Life Coaching arena. A basic framework for each part of a corporate training & coaching programme. All the details you need to implement your own ‘Confidence at Work’ programme. Confidence at Work – This easy to follow, yet powerful information, is presented as 2 separate PDF files (zipped together for convenience) at the very affordable price of £14.97 + VAT. Click the ‘Buy Now’ Button below and get your copy now. 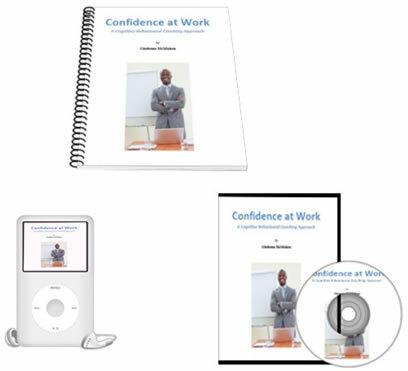 If you’re an Executive Coach, or Coach in the workplace, the Confidence at Work Presentation and E-Book will quickly become an invaluable resource and reference guide. PS. Please note this is a virtual product and the image is for illustration purposes only.